I made this cheesecake last weekend for the 4th of July festivities. By festivities, I mean meals. Olive has been consuming a lot of yogurt lately (plain, full fat awesome stuff sweetened with a little bit of honey) and I did one of those “I thought we were out” mistakes and bought a huge container to come home and realize we already had a huge container. I hate wasting and so I have been putting Greek yogurt in a lot of stuff , lately. This morning I made yogurt and oatmeal waffles (really good, I’ll post about those, soon) and when I ran across a recipe that called for 2 cups of yogurt in a cheesecake, I knew I’d found my way to not waste! Oh, how humble of me to eat a cheesecake in order to not waste yogurt. It’s a hard life. 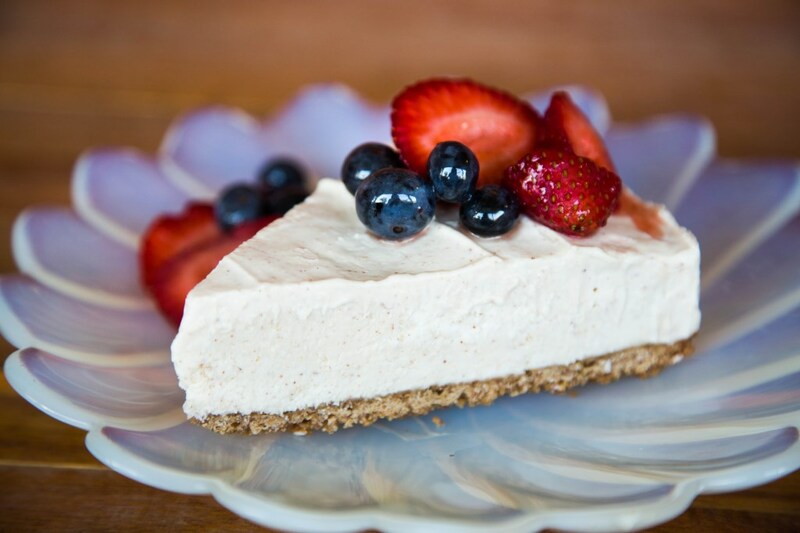 This is the no-bake type of cheesecake I grew up eating. I love the kind you bake and there’s a place for that (that place is anywhere) but for these super hot summer days, a lighter, fluffier, doesn’t-heat-up-your-kitchen dessert is the way to go. And using those strawberries I almost ALWAYS let rot on my counter is a plus, too! For the topping, I chopped up almost-bad strawberries, a few blueberries and mixed them up with a bit of honey and let it sit out while I made the cheesecake. By the time everything was ready, the topping was perfect. The addition of almond butter adds such a wonderful flavor. I think if I make this again, I’d try using peanut butter, just to see what it would be like! The original blogger of this recipe said that it was “healthy” and could be eaten for breakfast because it has yogurt and granola in the crust. I think that’s a marvelous way to feel like taking a nap at about 10:30, so I wouldn’t recommend it (this is based on experience). Just because something has granola and yogurt doesn’t make it healthy. This is perhaps lighter than most cheesecakes, but it also has cream cheese and whipping cream, so you do the math. Or don’t do math. Just enjoy dessert and stop thinking about whether it’s healthy or not. Of course you shouldn’t eat it every day. If you want to, then sure, obsess over calories. If you only eat stuff like this on weekends, then by all means, go for the gold. 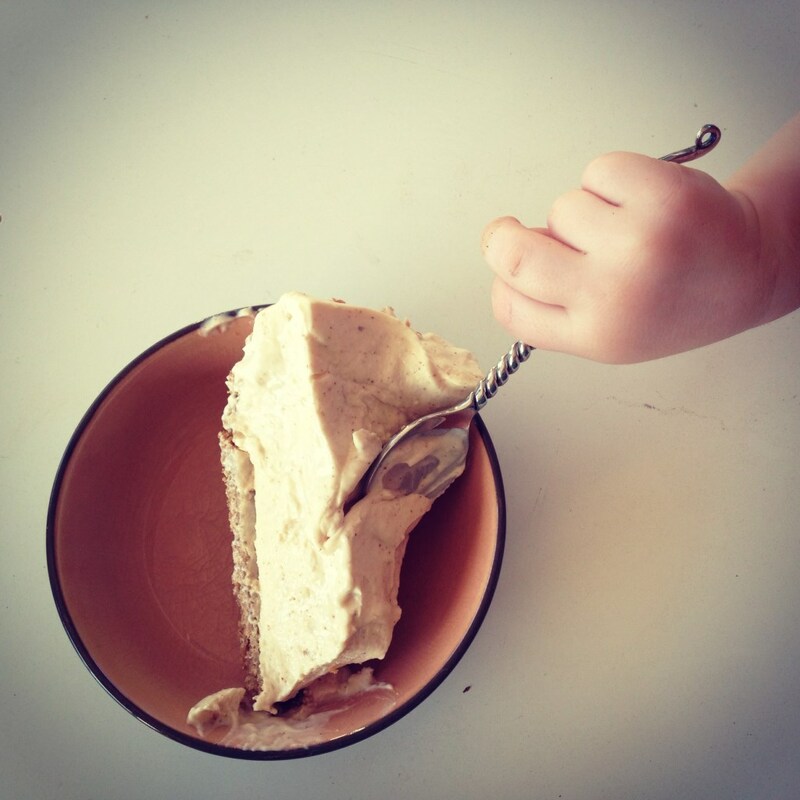 This little hand loved every bite. Preheat oven to 350 degrees. In a mixing bowl, combine the oats, coconut, and nuts. In a measuring cup or separate bowl, whisk together the salt, coconut oil, and honey. Pour this mixture over the oats, and stir to completely coat the ingredients. Spread the mixture into an even layer on a baking sheet, and bake at 350 degrees for 12-15 minutes. Flip granola around with a spatula every 3-4 minutes to prevent burning and to get an even golden-brown crisp. After baking, set granola aside to cool. Once the granola is cool to the touch, combine the granola and graham crackers in a food processor. Puree for 60-90 seconds, until a very fine and crumb-like texture. Pour in melted butter, and stir to combine evenly. Next, spread the crust mixture into the bottom of an 9-in round springform pan. Press down to compact into an even layer. Bake at 350 degrees for 3-4 minutes. (Do not let it burn!) Set aside to cool. In a separate bowl, whisk the heavy cream with the remaining 1/4 cup of sugar until stiff peaks form. Fold the whipped cream into the cheesecake filling. Finally, pour the filling into the cooled granola crust, and spread into an even layer with a spatula. Cover with foil or plastic wrap, and freeze overnight. To serve, run a paring knife around the edges of the cheesecake to loosen the sides from the pan. Then, unlatch the springform pan. 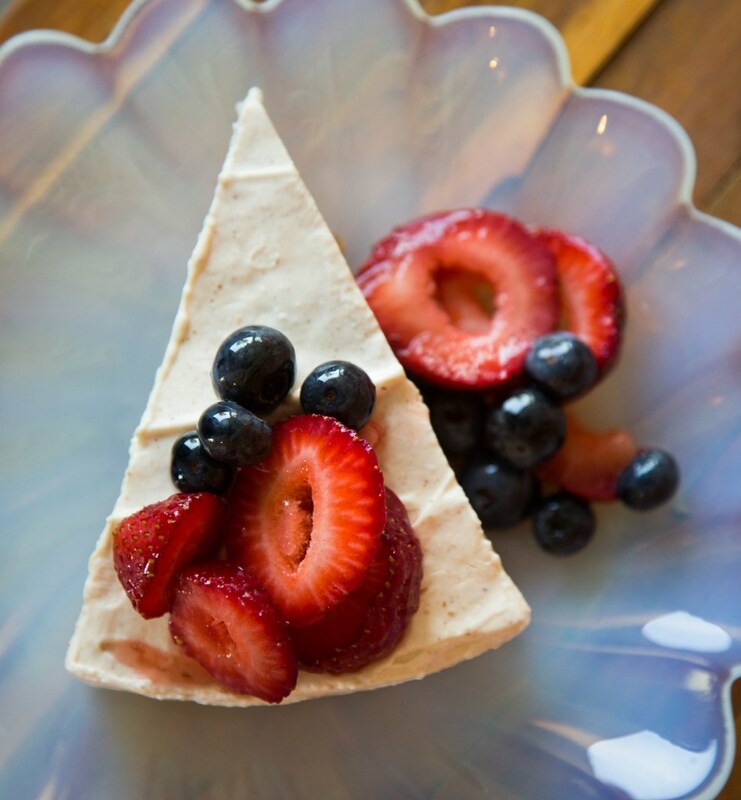 Transfer the cheesecake to a cake stand or serving platter and garnish with fresh fruit. This entry was posted in Cheese, Desserts, Fruity, Hearty, Snacks, Uncategorized, Weekend Fare and tagged almond butter, cheesecake, desserts, granola crust, greek yogurt, greek yogurt cheesecake, no-bake cheesecake, strawberry topping. Bookmark the permalink. This looks great! Can’t wait to try it. I’m notorious for buying almond butter but not using it! And might I add that I love reading this blog. It’s “foodie with a twist of practicality”. You are a talented lady and I love your written precence! Thank you, Jessica! It means a lot to me that you’re reading! I’ll be back to posting on Wednesday!